$70 Mail-in Rebate w/ Purchase See More. 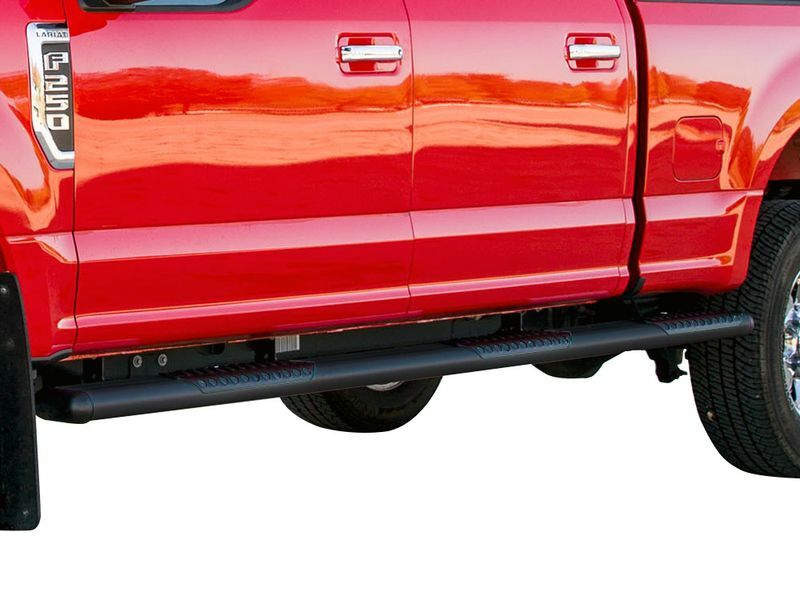 We found the perfect running boards for your work truck, or any truck really. They are Luverne black O-Mega II Step wheel to wheel running boards. They are constructed out of durable T6 aluminum with a beautiful, textured black powder-coated finish. They are corrosion resistant and protected against scuffs and scratches. Luverne black O-Mega II Step wheel to wheel running boards have black, non-skid aluminum step pads that have protruded circular treads that will give you the safe, sure footing you need. Another features is the black, TPO end caps that give them a clean, finished look. There is no drilling required when installing, just bolt-them onto your truck's existing factory holes and you'll be on your way. Get a set of Luverne black O-Mega II Step wheel to wheel running boards for easy access into your truck as well as the back of your truck bed. Your Luverne black O-Mega II Step wheel to wheel running boards are backed by a one year warranty on the aluminum and a limited five-year warranty on the original purchaser to be free from defects in materials and workmanship. If you have any questions or would like to submit a warranty claim, please contact us at your convenience. Luverne black O-Mega II Step wheel to wheel running boards are a piece of cake to install and takes about an hour to install. Also, most models are a no-drill installation. If you do have an issue or just have a question, don't hesitate to give us a call at 877-216-5446.